Voyages are typically 5 nights/6 days. The number of shark dives on the trip is virtually unlimited (in the surface cages). Each submersible cage will take 3 to 4 divers plus 1 divemaster, 3 times a day. Surface cages are unlimited and can take 4 divers at a time. The current record is 31.5 hours of cage time over 3 dive days. Cages close at 5pm on the last dive day to get ready for the steam home. We also offer 10 and 15 night Guadalupe combo-trips. 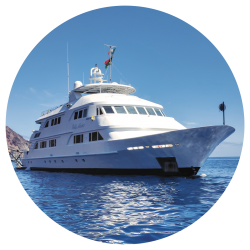 A 10 night trip combines diving with the Great White sharks at Guadalupe Island with a diving and snorkelling adventure with the amazing Whale Sharks in Bahía de los Ángeles, or the ultimate dive getaway in Cabo Pulmo marine park on our luxury yacht. 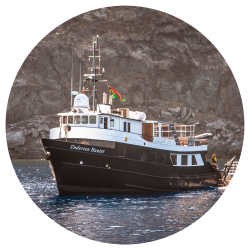 A very limited number of 15 night expeditions in November combine Guadalupe and San Benitos with the famous Giant Mantas, sharks, and dolphins of Socorro Island. We have identified over 261 individual great white sharks at Guadalupe Island, and more are spotted all the time! It is the best place in the world to see a consistently high number of sharks. The waters of Guadalupe are a brilliant blue and visibility is generally 125ft or more, which means you can see the sharks coming from a long way off, get the best photos, and study these amazing animals. Guadalupe is a protected area, which means that operators must operate under strict guidelines. 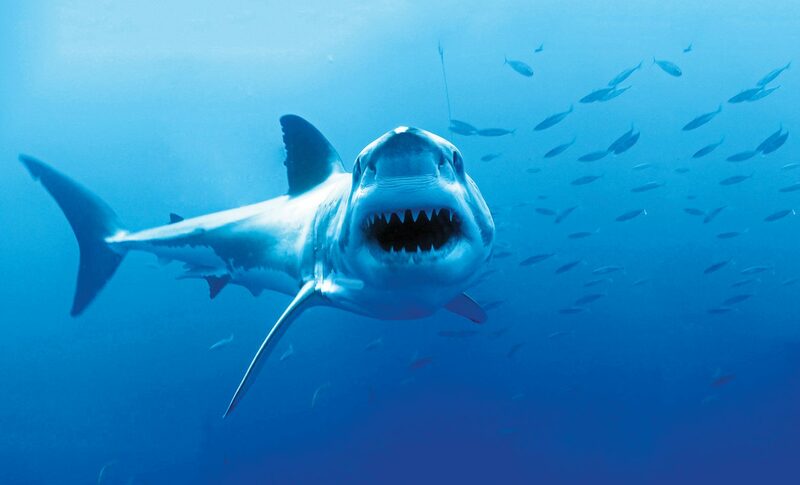 This ensures that the shark encounters at Guadalupe are kept as natural as possible, with no chumming or oil slicks. 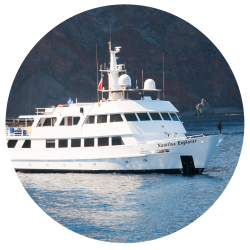 The exceptional Nautilus Explorer was custom designed and built in 2000 to be safe, luxurious, and perfect for liveaboard diving. She is the most requested boat, and is fully stabilized. The Nautilus Belle Amie was built and launched in 2015. She is the largest Nautilus vessel and feels like a 5-star floating hotel. The rooms are ultra quiet, spacious, and comfortable, and she is also completely stabilized. The Nautilus Under Sea was formerly the famous Undersea Hunter from Cocos Island. The Under Sea recently went through massive renovations, including gaining a full-width superstructure and much more! One of my biggest dreams has always been to dive with the great white sharks. We started off early in the morning, the mist was hanging heavenly down over the mountain and the water was calm and blue. Went down in the 2 person cage with Captain Baron. After only a couple of minutes it was there, so graceful just gliding through the water. A young male around 3,5 meters circled our cage for about 30 min. Once we were back on the surface I was filled with happiness and peacefulness after making one of my dreams come true and to share the water with one of the most beautiful animals on earth. 6 Stars! If you want to see white sharks, this is it! 3 days, 2.5+ hours per day. Great ship with a fantastic crew and never-ending delicious food. Way beyond my expectations! Thanks to Faith at DUI for setting this up and inviting us. The ship itself and the accommodations were impressive from the start. The staff has been amazing from minute one. You all heard of people being so kind they’re willing to give you the shirt off their back, in my case Jorge the deckhand gave me the cap off his head because the ever so popular great white cap sold out. The chef and service staff were amazing from making delicious meals and providing prompt service with a smile every time at all times.